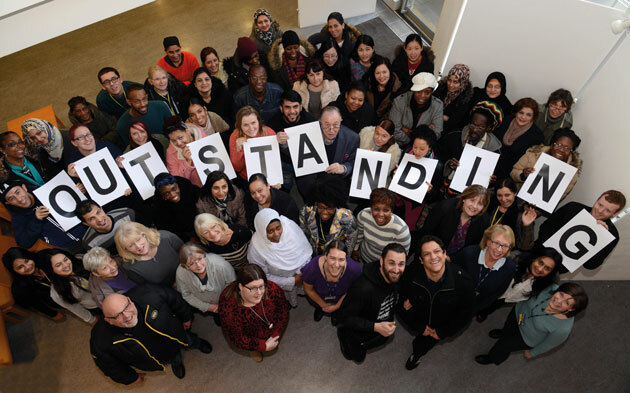 A Midland council is celebrating after its adult education provision was rated outstanding across the board by Ofsted. Wolverhampton Adult Education Service (pictured) was given a grade one rating in all headline areas following inspection last month. And staff at Stockport College also received good news from Ofsted this month with inspectors having found it had made “rapid improvements” in its first full inspection since it was slapped with a grade four in September 2013 — which had been down from outstanding. Inspectors, who visited the college in December, moved it up a grade to “requires improvement,” thereby taking it out of the administered status FE Commissioner Dr David Collins recommended last year. Meanwhile, Wolverhampton Adult Education Service, which has around 4,000 learners aged 19-plus, becomes only the third local authority to have achieved the clean sweep of grade ones for adult education provision under Ofsted’s current common inspection framework, following councils in Kirklees and neighbouring Walsall. Wolverhampton City Council cabinet member for schools, skills and learning Phil Page told FE Week: “This is an incredible achievement for our Adult Education Service and I’d like to pay tribute to the staff and students whose hard work has helped secure this excellent result. It also described the service’s leadership and management as “excellent” with a “clear vision of the needs of the community, which is shared by all staff”, and said the organisation has “very well thought-out and very extensive partnerships with local organisations”. Stockport College went from grade fours across the board to grade threes across the board amid a programme of job cuts that has seen the 690-worker college, which had already shed 235 jobs in the past three years, set to cut another 150 posts after Dr Collins recommended it shave £2.5m off staff costs. The report said the “considerable commitment of the new leadership team to bring about rapid improvements” had “improved staff morale and raised learners’ aspirations” and the board of governors had been “strengthened” by new members. However, it also said that success rates in some areas were “too low” and “progress in some subject areas is too slow”. “We are not complacent and we realise that while this is a positive step forward, there are still issues to address,” said Mr Clinton. “We have made many improvements in the last year and will continue to improve the college to provide a quality curriculum.